"Four out of five doctors prefer Camels. The fifth prefers women." Stock phrase in commercials for non-prescription products with some purported health benefit — especially items which are not actually health care items, such as sugar-free gum. Sometimes phrased as "Nine out of these ten doctors agree," showing you a group of men in white coats with stethoscopes. This is a clue to what's really going on. Your brain hears "Nine out of Ten Doctors Agree", and reads it as "90% of doctors agree." But that's not necessarily what happened — the sample size and population can be anything the advertiser wants it to be, including literally having a panel of only ten doctors asked (and cherrypicking doctors until they get the result they want). Alternatively, the claim may reflect reality, but what is being claimed isn't the same as what is being sold: listen carefully. Did nine out of ten dentists really say that their brand of toothpaste was best, or did nine out of ten dentists just agree that toothpaste in general is a good idea? Did they say they would recommend this brand over all other brands, or did they just say they would recommend it? In fact, if you catch wise to the fact that what the nine of ten doctors are agreeing to is something much more generic than what is being sold, you might start to wonder: What's up with the one out of ten doctors who thinks smoking is cool? As a result, it has become fashionable for some commercials to poke fun at the trope, implying that the tenth doctor would have endorsed their product, were it not for some external force (he was reaching for the "agree" button when a venomous snake bit him, sending him into a convulsion before he could agree). For the classic disassembly of these sort of statistics, may we recommend Darrell Huff's How to Lie with Statistics? The 1950s were a lot less naive than you might assume. Indeed, this is a subtrope of Lies, Damned Lies, and Statistics. This trope has nothing to do with Doctor Dolittle, Doctor Octopus, Doctor Faustus, Doctor Horrible, Dr. Phil, Dr. Slump, Doctor Strange, Dr. Strangelove, Doctor Fate, Doctor Zhivago, Doctor Jekyll, Doctor Wily, Doctor Manhattan, Dr. Eggman, Doctor Steel, Witch Doctors of any denomination, or any of the Doctors from Doctor Who because it's Not That Kind of Doctor, though you probably could find something at least nine of them agreed on (with the common joke being "Nine out of ten Doctors agree - Four's scarf is too long"). An extreme example: an ad for Whiskas claimed that "8 out of 10 Cats prefer Whiskas." This was later changed to "8 out of 10 owners who expressed a preference said that their cats preferred Whiskas." "Who expressed a preference" means there could be twenty thousand cats who'll eat anything for every eight Whiskas lovers, but they don't count. Another way to look at it is that it's entirely plausible 8 out of 10 cats would prefer Whiskas to, let's just say: starvation, being hit with a brick, being burned alive, or a bath. This actually gave the name to the Channel 4 Panel Show 8 Out of 10 Cats, which is all about statistics and opinion polls. A commercial for Tylenol stated that "9 out of 10 doctors recommend Tylenol!" The very next commercial was for Advil, stating "4 out of 5 doctors prefer Advil!" For all we know, the 10th/5th doctor just goes "What d'ya got?" After all, it's reasonable to expect you to keep on hand the one that works for you. These claims aren't necessarily mutually incompatible ... it's what goes unsaid ("in a hospital setting where we can monitor you to make sure it's not killing your liver," for example) that makes the difference. Stan Freberg parodied this as far back as the early 1960s with a commercial he made for Chun King Chinese food which proudly proclaimed that nine out of ten doctors recommended the product. The camera then revealed nine smiling Chinese doctors and one scowling Anglo one. Used in a BYU Library commercial modeled like an Old Spice commercial operating under Rule of Funny. Narrator: Did you know that eight out of five dentists say that studying in the library is 6 bajillion times more effective than studying in your shower? One of Marvel's solicitations for Nextwave claimed "nine out of ten dentists recommend Nextwave. In fact, they recommend it so much, they beat the tenth up, and he fell into line." One MAD cartoon had a group of dentists cheerfully saying "Brush after every meal!" with one surly-looking holdout muttering "I'm sure you have better things to do with your time." Pearls Before Swine had a few comics where Pig introduced his friends, five doctors, four of which agreed on everything, the fifth of which always disagreed. This was for more than just chewing gum — they went to a funeral, and while the first four were offering their condolences, the fifth one just said, "She's dead all right." A strip of 9 Chickweed Lane showed a group of white-coated figures walking away from another whom they'd apparently just hanged (only his legs are shown, dangling from the top of the panel), and an onlooker remarking, "Nine out of ten doctors agreed." A Snow White and the Seven Dwarfs Fun T-Shirt has the message "Six out of seven dwarfs aren't Happy." Pokémon: Mewtwo Returns: Misty and Brock drink some water from the Purity River and love the taste. Ash drinks it and says it tastes "like something's been swimming in it." Pikachu and Togepi try it and love it. Misty: Looks like four out of five water drinkers prefer Purity River water. Hard Candy. In response to the You're Insane! trope a character quips, "Four out of five doctors agree." The original Trident commercial is referenced on an early episode of Friends. Someone enters and says "Guess what!" and Chandler immediately quips, "The fifth dentist caved, and now they're all recommending Trident?" Parodied when The Goodies go into the advertising business in "It Might As Well Be String". Graeme: That's right. Mind you, it did take us a long time to find the right nine doctors, woo hoo hoo [makes loony signal] ... and the elephants! Parodied in a 2004 Corner Gas episode when Wanda admitted that she hadn't seen a dentist since 1992. Brent said, "Well, you should really try to squeeze in a visit every decade or so. Four out of five dentists recommend seeing a dentist. I don't know what the fifth guy's thinking." Humorous advertising-deconstruction program The Gruen Transfer has actually registered the company "Nine Out Of Ten Experts", and are offering the company's endorsement to products for a "small fee". Nine out of Ten Experts recommend The Gruen Transfer. RoboCop: The Series has an interesting example, nine out of ten doctors employed by a Mega-Corp recommend a drug (that is manufactured and sold by the same Mega-Corp), clearly in an attempt to invoke the trope. Colin: Nine out of ten Americans agree that out of ten Americans, one will disagree with the other nine! Colin: Nine out of 10 doctors agree the tenth one should really chill out. Colin: Nine out of ten dentists leaves one dentist. Parodied by David Letterman on his talk show, when he claimed that "3 out of 4 Americans make up 75% of the population." Ted: 4 out of 5 dentists just threw up in their mouth. Parodied on Fresh Off the Boat with Marvin, the Wongs' dentist neighbor, and his four dentist friends. One of them, Ted, always disagrees with the group on anything and everything. "Yes, mothers...nine out of ten British housewives can't tell the difference between Whizzo butter and a dead crab." From Lemon Demon's "Hyakugojyuuichi 2003": "Nine out of ten sociopaths agree / You gotta see Hyakugojyuuichi." How's that for meter? Les Luthiers give us this: "Out of every ten television viewer, five... are half of them". On February 15 2008, a news anchor on Royal Canadian Air Farce said, "A survey shows 51% of Canadians believe there is such a thing as love at first sight. The other 49% are men." Dying after beaming into a toxic atmosphere in Space Quest V: The Next Mutation results this quote, "4 out of 5 doctors agree that beaming into a toxic atmosphere without the proper equipment can be hazardous to your health." Max: [describing what happened to a beat-up gumball machine] A gang of five dentists came through the other night, and four of them just started beating the hell out of it! Sam: What did the fifth one do? Max: He kept sobbing, and saying, "Why can't we all just get along?" Tupari Drinks Machine: Nine out of ten Tupari drinkers recommend Tupari to their friends. THE LAST ONE IS ON MY LIST. Played for laughs in Assassin's Creed: Brotherhood: a doctor who's treating your bullet wounds will mention that four out of five doctors would use leeches, lucky for you he's the fifth. A strip in Legostar Galactica has this. It turns out that the doctor being talked to is the tenth. Inverted in The Bird Feeder #15 , "Statistics." Josh states that he's heard one out of three birds has yellow feathers, while standing in a group of three birds, none of which have yellow feathers. 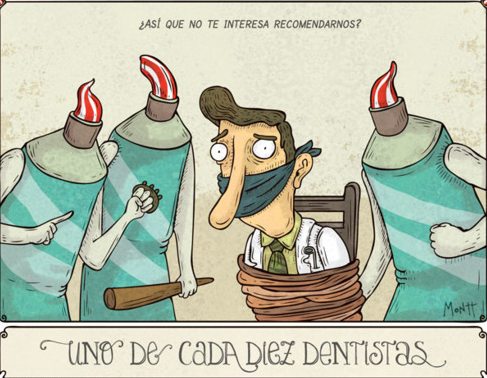 This spanish webcomic ◊ shows a dentist just talking with his secretary when he is assassinated. Then the sniper tells that the last target has been disposed. With the news saying that statistics shows that 10 out of 10 dentists recommend sugar-free gum. This comic ◊ shows what ends up happening to the doctor who doesn't recommend the product. It translates to the sentient toothpaste tubes saying, "So you are not interested recommending us?" 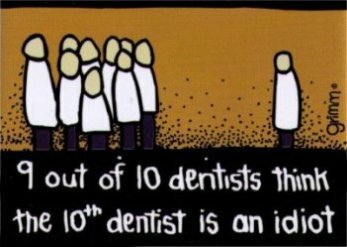 while the caption translates to, "One in ten dentists..."
The Swedish humorist site Skrattnet used to have a tagline that translates into "Skrattnet, because 20 out of 10 schizophrenics recommend us." Parodied by 5 Second Films. "Nine out of ten scientists agree... guns are dangerous." The nine scientists then use their guns to hunt down and kill the tenth one who disagreed. "Yes folks, nine out of ten doctors recommend eating at least one Krabby Patty a day to maintain a healthy lifestyle and a youthful positive attitude." The Looney Tunes films "The Major Lied Til' Dawn" and "Daffy Duck and the Dinosaur" do quick references for Wheaties cereal for the era they were released ("With cavemen, it's Duckies, 2 to 1"). Anslinger collected dubious anecdotes of marijuana causing crime and violence, and ignored contrary evidence such as doctor Walter Bromberg, who pointed out that substance abuse and crime are heavily confounded and that none of a group of 2,216 criminal convictions he examined were clearly done under marijuana's influence, or a discussion forwarded to him by the American Medical Association in which 29 of 30 pharmacists & drug industry representatives objected to his proposals to ban marijuana. One such statement claimed that the proposal was "Absolute rot. It is not necessary. I have never known of its misuse. ", although only the single dissenter (who noted he had once encountered a doctor who had been addicted to marijuana) was preserved in Bureau files.